While Amazon Bengali Bookstore for Books in Bengali is great to find rare books, may be banned print books, easily browse among literally millions of Titles; it is threatening to the small business owners specially in Kolkata/Calcutta and Bangladesh as well as the Publishers in Calcutta Book Fair – the rare and existing International Book Fair for the consumers on this earth. Amazon is clearly a blacklisted company by Richard M. Stallman, Founder of President of Free Software Foundation. However, in terms of spread of culture, availability, definitely Amazon Bengali Book Store has positive effects. As Amazon has their own on demand publication platform Amazon CreateSpace and it costs nothing to self-publish paperback books with ISBN, separate Amazon Bengali Bookstore possibly spread the effect of Little Magazine to the International space. Also, many who are interested in book publication or has paperbacks in Bengali Language, may get interested to publish paperbacks in Bengali Language. It may happen, it can create a separate new segment. World Wide Web or WWW is over the Internet retrievable system of electronic hypertext documents, through hyperlinks and about the HTTP or HTTPS protocols. 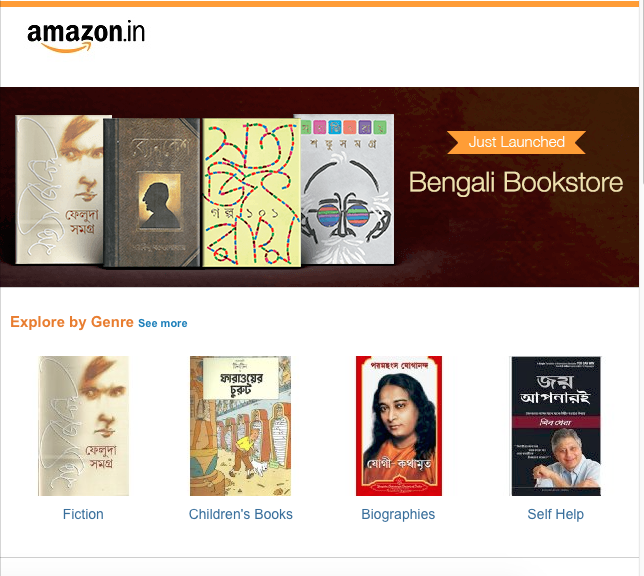 Cite this article as: Abhishek Ghosh, "Amazon Launches Bengali Bookstore for Books in Bengali," in The Customize Windows, June 9, 2016, April 23, 2019, https://thecustomizewindows.com/2016/06/amazon-bengali-bookstore-books-in-bengali/.